Make a slide show video for Instagram (square video) which we will call &quot;IF YOU THINK&quot; campaign video. The slide show will have 6 slides (six different plain background colors) of 5 seconds each = total 30 seconds. 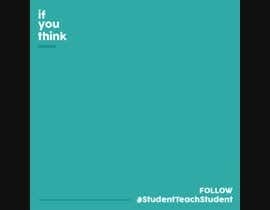 Each slide will have these words written in lower case letters on the top left corner &quot;if you think&quot;. how long? I am about to award an entry. can yours be better and quicker?